Well, the good folks at Twisted Pixel Games are at it again. We are all great fans of the studio, and not just because they were among the first industry people willing to deal with a fledgeling BrainLazy.com. They have consistently churned out some of the most original games out there, dripping with novelty and nostalgia in equal parts. Now comes their first foray into the world of retail games, and the first to utilize the Kinect. Corrugated Cardboard: A valuable part of every seagoing vessel. Like most aspects of this game, the visuals are a bizarre mixture. 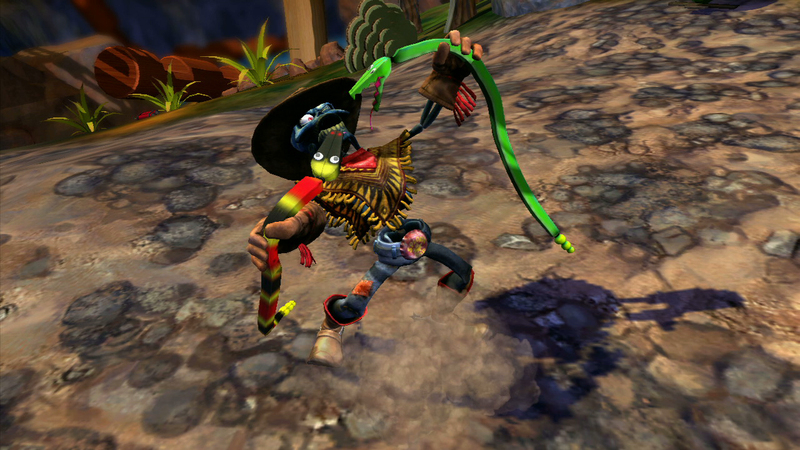 The game is presented as a puppet show. It ostensibly takes place on stage, but the environment is positively sprawling. It scrolls along with you, taking you through old west deserts and towns. It doesn’t end there, though. You’ll see orient-inspired settings, riverboats and swamps, and even the hazy edge of the hereafter. My favorite part, though, is that at no point is any attempt made to disguise the fact that everything around you is handmade. The mines in the river are tennis balls with push pins. The riverboat’s hand rails are drinking straws. Better yet, the entire cast, friend and foe, is made up of puppets. 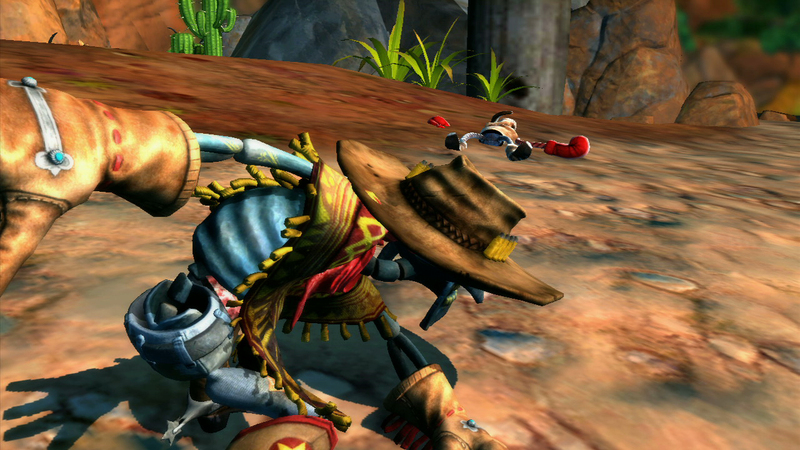 Our hero is a highly detailed and decorated skeleton marionette. The posse he seeks to destroy are a varied lot, and not only are they puppets, but they are puppets of different types. A crooked sheriff looks like he could be the mean uncle of Bert from Sesame Street. An aging madam who could be a contemporary of… well, Madame. Other puppets look to have been pieced together out of bits and pieces of appropriate equipment. The oil baron seems to be made from a beefy oil can, and the madam may literally be a red light. The controls of Gunstringer tie more closely to the presentation than any game I’ve ever played. All control is done via the Kinect sensor. Since your hero is a marionette, your left hand is holding the strings. Move it left and right and the hero follows suit. Give it a jerk upward and the Gunstringer jumps. 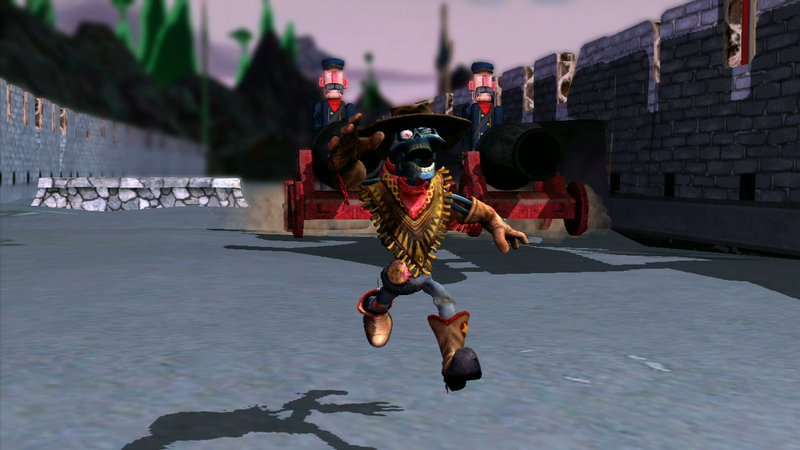 Since the hero is also a pistol-packing cowboy, your right hand controls his gun. 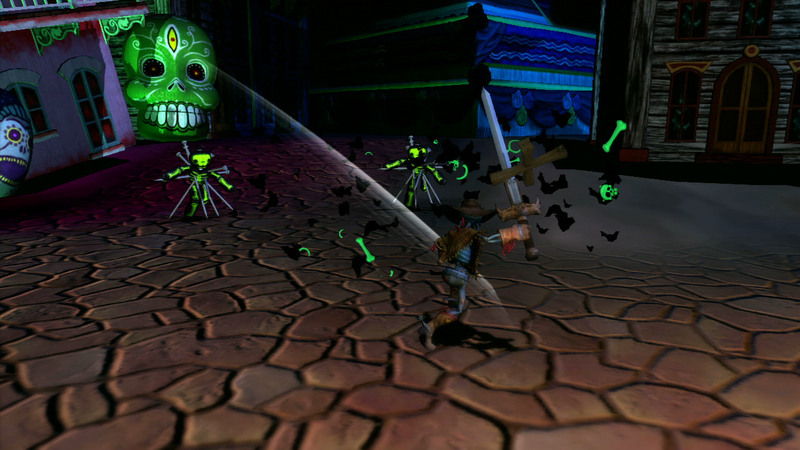 Sweeping your right hand moves a targeting reticule across the screen. When it crosses a target, the enemy is tagged. Six bullets? Six targets. Once you’re ready to fire, jerk your hand up in a “bang, you’re dead” maneuver. All tagged targets will be picked off, in order. That alone provides a remarkable amount of strategy, requiring you to tag high risk targets first. Sometimes the bravest thing to do is run away screaming like a little girl. 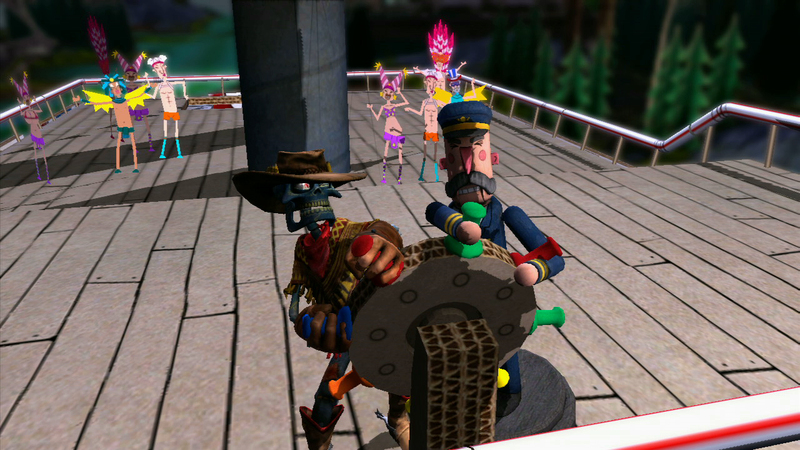 Through most of the game, the level will auto-scroll, whether you are on foot, straddling your trusty steed/spool, or riding a train. As you stroll along, pits will open up ahead of you or obstacles and platforms will require you to do some fancy footwork to stay safe and keep moving. Sometimes one gun just isn’t enough, so the Gunstringer draws a second, prompting a matching reticule and auto-fire. At this point the game becomes about aligning the reticules with the targets as they appear. Some sections of the game remove enemies and just throw obstacles at you, turning the game into a… well, let’s call it a slow-time event sequence. Cover based combat makes an appearance, requiring you to lean out from behind cover after tagging targets in order to fire. From time to time the trusty pistols are replaced by a potent shotgun, a sweeping flamethrower, and a zombie/ninja-slicing sword. Seldom does a full level go by where a single play-mode lasts from end to end. It keeps things fresh, and constantly tests your skill with the controls. By the end, you’ll have experienced elements of Panzer Dragoon, Space Harrier, 3D World Runner, and (as cleverly referenced) Duck Hunt, all played via the Kinect. Which brings us to the thing that really matters. Does the Kinect rise to the challenge? Well, I won’t lie. The Kinect isn’t the most precise piece of equipment. Both aiming and dodging trail slightly behind your motions, requiring a bit of practice and trial and error in order to learn how to compensate. Twisted Pixel did an excellent job ramping up the difficulty and intensity slowly, allowing you to get a feel for the controls. Once you’ve got a grip on what motions cause what reactions, and how quickly, the game quickly becomes hugely satisfying. The arm-jerk firing worked remarkably well, and while I’m quite used to the process of maneuvering with one thumb and aiming with the other, doing the same thing with with my whole arm is another experience entirely. My favorite moments were when I found myself leaning out from cover to the left and firing to the right, forcing me in real life to adopt an Eastwood-esque aim across the body. The reticule is just big enough to make up for the sluggish motion and so-so precision, but just small enough to require you to aim properly to be sure that you’ll score a hit. Collecting a “Devil’s Taco” starts a high scoring kill-streak to boost your score and test your skill. I can honestly say it is one of the few games I’ve played via the Kinect that was fun to play without requiring me to dance. I really liked the audio in this game. Whereas Twisted Pixel tends to flood their games with a broad spectrum of pop culture comments, this time around they manage to keep things a little more focused, with the good old spaghetti western at the center. Key to this tone is the narrator, who if not for Bastion would probably be the highest quality gritty-voiced spokesman you’re likely to hear in a game. He’s a source of a huge amount of the humor, thanks to the way he delivers utterly absurd lines with the utmost sincerity. 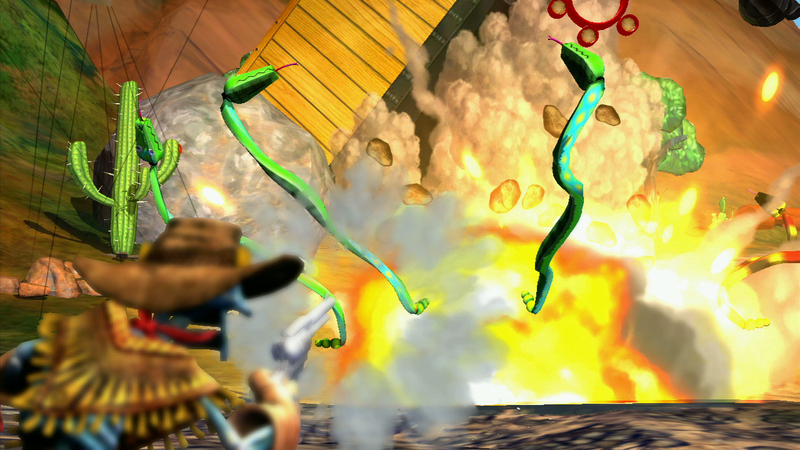 “The salsa picante SURGED through is bones.” Aside from the top notch voicework, the music continues to raise the bar. The song that plays over the end credits is frankly excellent, worthy of a place in an old school western. Always bring a sword to potentially zombie infested areas. The story begins with our hero rotting in a shallow grave, but a quick tug of the strings soon straightens that out. It seems our hero was gunned down by his own posse, and he means to return the favor. The story serves as an excellent framework, providing justification for the vast variety of humor and environment that the game serves up. You probably won’t find yourself emotionally invested in the characters, but it is an entertaining yarn they spin. 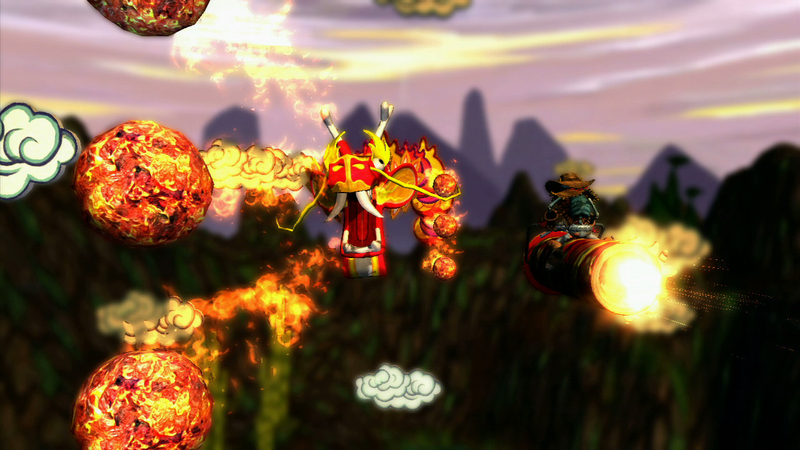 Gunstringer is a very strong outing for Twisted Pixel as their first retail game. If you play it long enough to earn a few high scores and unlock all that the game has to offer, and take into account that you get the full Fruit Ninja game in the very same box, it is an excellent value. Perhaps the biggest value add, though, is that you’ll actually use your Kinect for something other than Dance Central. 8.6 / 10: An extremely entertaining game, and one of the few to put the Kinect to good use. Sometimes the bravest thing to do is run for your life.